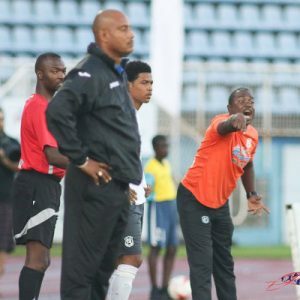 Taking pot shots at one another and making snide remarks is definitely not the way to go, say four Trinidad and Tobago Pro League (TTPL) coaches. What is needed is for football people to come together and talk about the state of the sport in the country so as to better be able to diagnose and solve the root problems plaguing it. St Ann’s Rangers owner Richard Fakoory recently suggested that, in a worst-case scenario where Government decides not to cough up the TT$50,000 monthly subventions to Pro League clubs, the League’s players should be prepared to go unpaid (by their clubs) and without prize money (from the League). 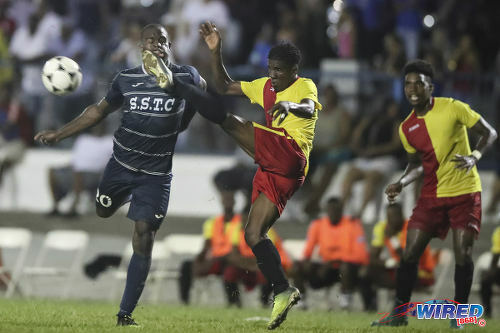 Photo: North East Stars wing-back Jameel “Shooter” Neptune (centre) kicks Police FC attacker Elijah Belgrave in the face during Pro League action at the Arima Velodrome on 28 July 2017. 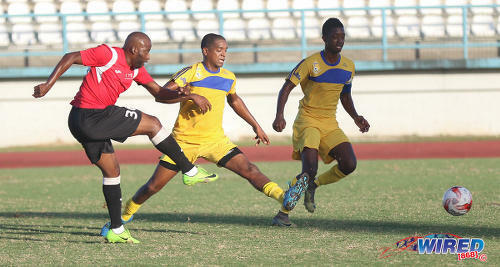 Looking on (right) is Stars defender Seon Thomas. 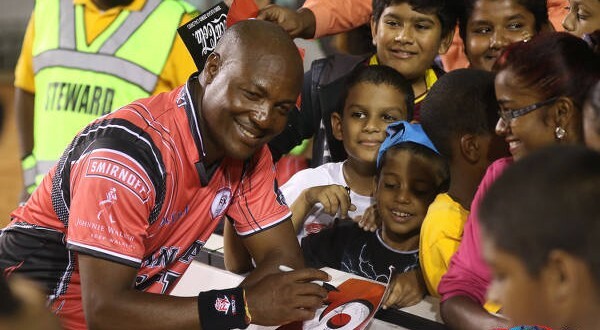 Trinidad and Tobago Super League (TTSL) president Keith Look Loy on Tuesday publicly disagreed with the suggestion, dismissing it as a “political” attempt to protect currently held turf. Even before his talented team lifted the 2017 Pro League crown, North East Stars’ Derek King urged coaches to stick together and remain respectful to each other when the financial issues took varying tolls on clubs during the course of the season. 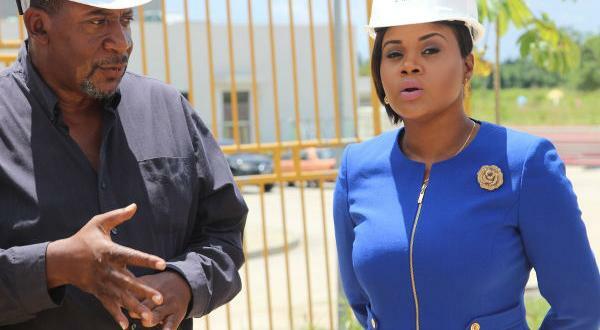 And speaking to Wired868 yesterday in reaction to the above comments, King would have found his implied fears echoed by W Connection’s Earl Jean, Club Sando’s Angus Eve and San Juan Jabloteh’s Keith Jeffrey. There was strong endorsement for the view that football stakeholders need to put their egos aside in order for the game to move forward in the near future. He stressed that he was not going to engage in any do-as-I-say-but-not-as-I-do behaviour by any direct response to either statement by the two footballing gentlemen. 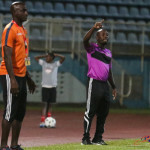 But, like his three colleagues, he did not seriously dispute the view that the recently completed 2017 season has been the TTPL’s most challenging one to date. 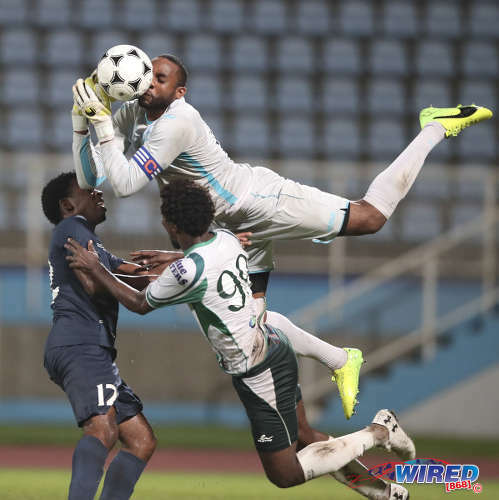 Photo: Police FC goalkeeper and captain Adrian Foncette (top) tries to keep hold of the ball while airborne between teammate Nequan Caruth (left) and W Connection attacker Marcus Joseph during the TTFA FA Trophy final against W Connection at the Ato Boldon Stadium on 8 December 2017. For example, former three-time Pro League champions Central FC had a steep fall from grace, finishing ninth on the ten-team table. 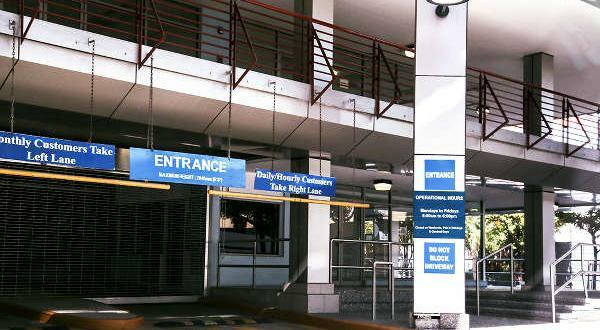 Financial reasons forced the departure of several of their key players. In fact, things got so bad there that Stern John, catapulted into the position of coach by the sudden resignation of Dale Saunders, eventually had to dust off his boots and double up as player/coach. Fifth-place finishers Jabloteh were unable to spread Christmas cheer to players who would arguably have experienced a bleak season after having to go home without their hard-earned financial rewards. Former national midfielder Eve pointed out that both the TTPL and the TTSL have been running their respective operations smoothly for years without friction. He wondered wordlessly what had changed. 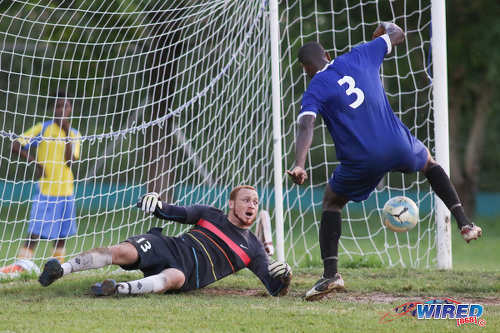 Photo: WASA FC goalkeeper Denzil Carabon (left) and defender Phillip Nelson have a scare during a TTSL One match-up against QPCC at the WASA grounds, St Joseph on 2 July 2017. Jean also pleaded for the various football heads to put their agendas aside because, according to him, the youngsters who dream of having professional careers abroad are the ones feeling the brunt of all the behind-the-scenes rumbling. Acknowledging that the League itself is struggling to remain afloat, even relevant and that the clubs are facing very difficult financial times, the foursome stressed that the success of the Senior Men’s National Team is dependent on the existence of a properly functioning and well-supported professional league. Moreover, they insisted, the TTPL’s importance for youth development cannot be underestimated. But at the heart of any discussion involving the TTPL, TTSL, TTFA and sponsors, there is bound to be the mighty dollar. 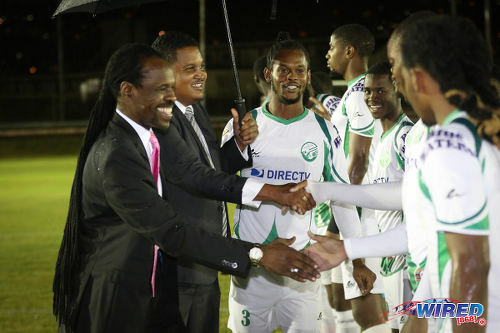 Photo: Sport Minister Darryl Smith (second from left) and Minister of Public Utilities Fitzgerald Hinds (far left) meet players from W Connection before kick-off against Morvant Caledonia United at the Hasely Crawford Stadium training ground on 20 January 2017. Although all four coaches agreed that the Pro League clubs should continue to lobby Government for assistance in some form or other, Eve suggested that the Ministry of Sports and Youth Affairs should not be the only ministry backing the Pro League. According to Eve, support for the League should also come from Community Development, Education and National Security. “Players, coaches and administrators need to find ways and means to improve the football,” Jean said. We don’t want to put in the hard work; we want the fast buck! Photo: TTFA president and W Connection owner David John-Williams (centre) poses with his daughter and club director Renee John-Williams after the club’s TTFA FA Trophy final win over Police FC at the Ato Boldon Stadium on 8 December 2017. 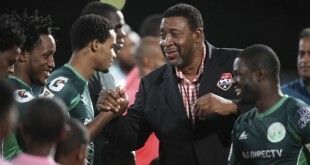 King expressed the view that the Pro League club owners would have to decide whether or not they can continue to foot the bill for a professional football outfit if the government subvention stopped. Jeffrey called for the government to continue the subventions even if they had to be reduced. He said that the clubs would greatly appreciate any such move because the cut had hit the Jabloteh staff of some 33 persons really hard. King pointed to the fact that, even with the subvention, the salary some players were earning was inadequate. Eve’s response was that the sum was not a king’s ransom but it was enough in his view to prevent players from turning to a life of crime. So is the TTSL a better option, as suggested by Look Loy? Both Jean and Jeffrey were unequivocal with their responses, both stating that it would represent a step backward for the local game. “Going back to the Super League will be like going back to the stone age of local football,” Jeffrey said, “because players will be going to work from 8-4 or 6-2 and then you would ask them to come three hours after and train as hard as a pro player. Eve added to that the issue of the constitutional arrangements, whether the TTSL would be willing to dance around their League statutes in order to accommodate clubs from the Pro League. “As far as I know, to get into the Super League, you are supposed to pass through the various zones. […] Are we going to circumvent the process for them to get in? 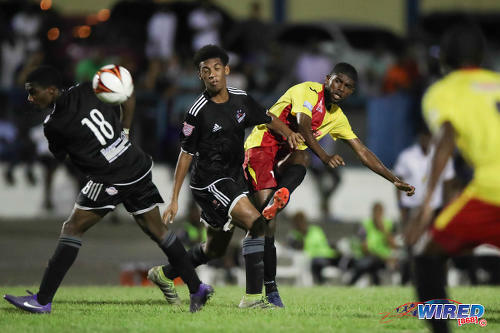 Photo: UTT striker Cornell Glen (left) fires home the decisive goal past FC Santa Rosa defenders Jesse Reyes (centre) and Alfie James during TTSL action at the Larry Gomes Stadium on 10 December 2017. Jeffrey’s view was that Pro League players needed to be treated as professionals and so, like Look Loy, he wholeheartedly disagreed with Fakoory’s proposal. “I do not agree with Mr Fakoory and his philosophy as to how the football should run,” Jeffrey said. “When a player comes to you for four hours and gives of his best, how that can be free? […] That’s a job like any other job. However, Jean said, a promotion and relegation system between the Pro League and TTSL would be no problem and he would welcome a constitutional change to make that possible. The four coaches all agreed that, whether or not the TTPL or the TTSL win their respective battles, the game still does not get the respect it deserves. They feel that football’s achievement of taking the country to the 2006 World Cup has been undervalued and underestimated; no other sporting discipline or feat has been able to galvanize the nation like it. 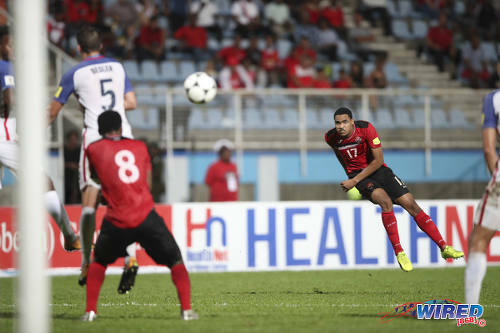 Photo: Trinidad and Tobago right-back Alvin Jones (right) smashes a long-range free kick towards the USA goal during 2018 World Cup qualifying action at the Ato Boldon Stadium on 10 October 2017. And Jeffrey had the last word, attempting to shift the focus off the micro-issues and put it where they all agreed it properly belonged, which is on the big picture. ..Agreed. The “inefficiencies” are way more than “some”..
Well, then there are some inefficiencies about governance. Going to the constitution will be a priority and therefore constitutional reform. This cannot continue the same way. ..These arguments arise from the lack of broad consultation on the road forward for football and the absence of the national plan that would emerge therefrom..
We need a national plan for football in tnt, otherwise we will never be on the pathway to developing football on a consistent basis. All these arguments prove very unhealthy for football in all departments and levels. So very true but to many people is only about self eh. Them really good yes. Of course we need to maintain a functioning Pro League. Problem is that’s not what we have. And it seems like we are going backwards. So I don’t have much hope anymore. Maybe Skeene and the Pro League owners should have a public symposium and let’s thrash it out. The whole of football needs a symposium. This is bigger than the Pro League in my opinion. Exactly Mango. Dat national consultation on football was just for show. And there was no need for any consultation nah because many moons ago our sports writers Hugh Henderson, Fazeer Mohammed, Gregory Trujillo (R.I.P) Alvin Corneal, Andre Baptiste, Keith Shepperd (R.I.P.) Brian Lewis, Mr. Live Wire just to name a few use to be writing on how to fix the problems with our football/ sports eh but these administrators , presidents , advisors of the TTFA didnt business because they always had their own agendas just look at the present situation with the coaching courses if one doesnt belong to a certain clique forget about you yes and that is how things is still being done in this present time. Them really good yes. The pro League was and still is a Political tool, it was for Jack to reap money from FIFA, and it became a tax break for others, with little accountability. It must change, because it is a livelihood for many, it keeps youths off the street. But until it is done professionally, it will not see 2020. The IPL T 20 is successful because it is run by professionals, the Franchises are run by Professionals, therefore it attracts big partners and Sponsors. This is the same for all pro leagues. Michael Jordan is the only former player to own an NBA franchise, you do not see it run by players. The new head is Adam Silver, ever see him shoot a 3pointer? In its present state, it has failed. Sheldon you first have to look at why a pro league was implemented in the first place .Based on the structure Jack Warner implemented it was only time would reveal if the league could stand on it’s own . We should ask ourselves this question: As a Businessperson, who has sacrificed for many years o now be in a position to have your family secure, would you invest your money into TT Pro League, a League that has never shown a profit after all these years, and depends on Government subventions? The answer to that, is your answer. I dare say watch how much Fakoury invests into his team, and he is a successful businessman, who has been involved in both football and basketball in this country for many years. His team being the lowest paid all-round. Business is no longer into handouts, business partnerships, Yes. But based on a viable business plan. There are many factors that i can point too today. Players cannot take care of their home’s ,mortgage’s they cannot buy basic need’s which should be easy. Earl so you mean like regional or county teams? To those of you who said’s our players are very poor.I want you to know this. Psychologist has determined that sports men and women in third world countries are under tremendous pressure to concentrate . Due to the somatic markers in the brain concentration is and will always be inconsistent because of the very substandard life the live . The European player’s and South American player;s can concentrate for much longer time because all he has to think about is to play. Players outside of those regions does not only think’s of his or her standard of play , but also where is the next meal coming from ,does he possess the correct gear .I know that feeling when i was in the New York Cosmos. I never ask how much was the cost of an item in a store. All i would say is give me that item without any worry about cost for the basic need’s.Not a worry in the . All i had to do was just think about raising your level of play to and above all the player in the team. Though we may show disgust to our players due to their poor performance’s we should have some empathy and try to understand their plight . Alyuh know how long I have been telling meh friend Spiderman that he have to share is football wisdom on wired volley eh well done Spidy so now they all understand why our players can never concenstrate for the whole game. Them really good yes. So they need a pro league to make the national men’s team? What a bunch of crock. So what accounts for the dismal performance of the men’s team these days? A dismal pro league no doubt. ..I and TTSL are not at war with TTPL, and certainly not with any of its member clubs. My invitation to any and all interested TTPL clubs to talk to TTSL is merely an expression of concern that, should TTPL collapse, the member clubs thereof should not have to fold up or play in a zone. But TTPL people not grasping the realities that have confronted them for YEARS. They seem incapable of thinking beyond their failed “model” and of looking to anything other than State largesse to save their crumbling league. I have articulated my default position ad nauseam over many years but some people not listening. We need ONE, multi-tiered elite men’s league, uniting clubs from regional to top level, based on promotion and relegation. This will ensure technical merit is the basis of a club’s menbership at any level and condemn the closed shop that TTPL is, where a club could finish last for years and remain a member to the dustbin to which it belongs. There. I can’t be any clearer..
Keith, I think there are a lot of egos involved here, and probably a bit of negative history as well. It may be a better approach to quietly negotiate TTSL general Secretary to TTPL admin person behind the scenes to get to a middle ground. Has that approach been tried? ..I have attempted more than once since the formation of TTSL in December 2016 to initiate formal talks. The last time, about six to eight months ago, before we were recognized by TTFA, when I wrote seeking talks about technical cooperation, the response from TTPL administration was that they needed guidance from TTFA regarding whether they could talk to us. Look, Super League is the new kid on the block and we had a tremendous inaugural season. We drew crowds. Our digital foot print cannot be ignored. People look forward to our matches. We turned a profit. I/we do not need to take on TTPL problems. I/we could quite nicely go about our business. But my concern here is for the future of domestic club football. If some people vex and want to hold on to the past so be it but I always look to the future . I think we all share the same concerns for development of the youth and the game. Be tireless in your efforts. Don’t give up. The clubs that was paying that kind of monies were W Connection North East stars because the two owners had plenty monies eh and of course Jabolteh because of their big sponsor Clico . Them really good yes. A pair of football boots the real top of the line one cost about $ 3000 monies . Them really good yes. Dion, 10 years ago club were were paying 15K and 20K. Pro league and super league clubs vying for the same resources. The financial models are identical. Business plans developed and presented to corporate T&T in the hope that theyre impressed. Or, as is the norm, yuh have a padna/relative who is a shot caller in a company and yuh could drop off an email to and they agree to give yuh some cash or product. Guaya is the one team that ticks over the turnstiles so they have some leverage to get potential sponsors and advertisers to listen. The pro league have been given tidy hand outs by the state over the years so their exposure to private sector probably less than the Super League clubs. 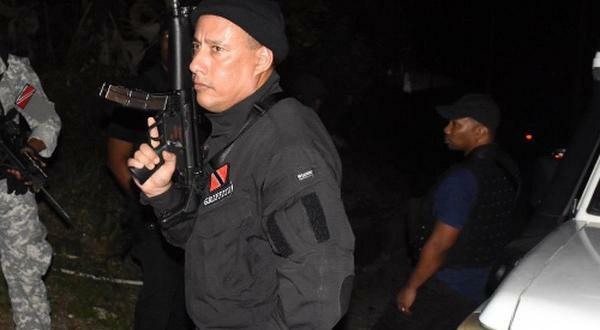 My question is that the Government of Trinidad and Tobago give’s each club in the pro league except the protective service’s a substantial amount of money monthly. What does the government gain by such good deed ? We have to be careful knowing the price of everything but the cost of nothing. Dion , i think we need to look at it from a different angle . Dion Sosa do you think the so called pro league is salvageable? Good answer. However, i did several interviews in 2013 while coaching Jabloteh .I call on the owner’s of the league to take the football back to the community , which is where it should have started in the first instance due to Jack Warner. Furthermore, the PNM government had a brilliant plan in place to be implemented just before the PPP government came to power. Each club after identifying their location in the country, would have the playing field’s fenced , portable seating, portable toilet ,with each field lighted . People invest in great ideas, run by others with proven track records, with proper accounting, and who can show return-on-investment. They invest in well researched plans, showing multiple income streams, and a way out when they have covered their investment. Investing is a business, not a charity. Minister of sports at the time Arnell Roberts decided not to implement that structure because it was a PNM idea? What they calling Pro League Football is NOT Pro League Football;imagine a big man getting $3000 a month.No wonder we are cosidered Third World!! Well Bankers Trust tried that with Central F. C. eh and the ex sports minister and his right partener Kevin Harrison didn’t want that to happen at all , and ah wonder why. Them really good yes. Bankers Insurance isn’t a bank though. But your point is good anyway. And who can the banks and other corporate sponsors really TRust eh considering the track records of the TTFA the professional league super league and the sport company to many smart men in the sports business and only about themselves Them really good yes. Good point. But then you could only ask. And try to show benefits for them. Who says they are the only ones making money? So massy…mcal group..baghwansingh..dabadie hardware…gopaul group…..they ain’t run d route during the previous regime….they could geh we back some of that now. There is like almost an arrogance that these companies have to invest in these clubs. They don’t and they haven’t because in terms of marketing and the product on the field of play there are no visible means of return to a potential sponsor. People talk in general about a business plan and all of that …maybe those plans have been rubbish. Earl Carter’s was the closest I saw to being a viable one. ..It simple to understand if people want to understand.. So ….is de word that the government not giving the subvention? Any approach resembling transparency or at least clarity is just in the public servant handbook. If they said it clearly, Pro League clubs, Soca Monarch promoter, GATE students… everybody would know what is want and could at least cut their cloth to suit. But nope. They will wait til three months in the pro league to say probably. But that is not the same as saying no more subventions. You think subventions are now history? The Pro League is not a national league. They have not had a Tobago club in close to or over a decade. There are structural flaws that I don’t know if they are trying to address. I just keep hearing that they want to keep patching up something that isn’t working. At least let me hear about some radical change in direction that helps with at least one of their issues. I think the owners of the league are very happy the way it is run at the moment. You ask a good question , but i don’t think you will get an answer.You have to put them under pressure with your pen. I believe it is intentional to minimise travel costs. So I’ve been told. I understand that finance is an issue but like so much else it just doesn’t seem as though they are working hard enough to find solutions. They’ve just accepted that and go on year after year. You cannot be the only one to show deep interest in the running of our football.Where are the other voice’s ? The Pro League is unsustainable in its current incarnation, and has been so for a number of years. It seems as though people want it to be a government run/sponsored league, because I have never heard of any plans (stated publicly) to have the league be a viable business. I have never heard of any concrete plans to put people in the seats. All I have heard from Skeene over the years is that the league is improving and doing great. How long has Skeene been in charge now? Yuh mean it have nobody else who willing and able to revamp de league and really make it professional? I does wonder if when clubs trying to get in de Pro League if dey does even study how dey going to generate funds, or pay their employees, or generate a fan following etc. From the outside looking in, the league has been professional in name only for a long time. They are told, or advised in every school I have been to.